Recently, I’ve read two excellent articles on why women stay quiet at work which clearly outline the challenges women can face in leadership roles, and the need and benefits for them to have a voice. One, a Harvard Business Review piece, “Women Find Your Voice,” by Kathryn Heath, Jill Flynn and Mary Davis Holt, the other in The New York Times, “Talking While Female: Why Women Stay Quiet at Work,” by Sheryl Sandberg and Adam Grant. Both articles highlight key points and tools. Combining them with a few additional tools, as seen in our research and experience with leaders, can significantly increase individual, team, and organizational integrity and success and the integral role that women leadership can play in these outcomes. First, the HBR piece stresses a key aspect of courageous conversations: be mindful, and plan what you’re going to say. Two common reactions people report having under stress: losing focus and adding superfluous words, both of which dilute the power and goal of the communication. Here’s the critical additional step: practice having the conversation with colleagues or a friend, repeatedly if necessary, before attempting it “live.” This is the key element of building skillful courage. Most of us know “what” to do but not “how” to in a challenging situation, when the stress hormones cortisol and adrenalin are pumping through our veins. “If we practice with some level of stress in a ‘social flight simulation we, like pilots, create the muscle memory to act in the way that we’ve practiced when the real situation arises,” says Dr. Lynne Henderson, author of The Compassionate-Mind Guide to Building Social Confidence, and creator of Social Fitness Training, a cognitive behavioral training program for teams. She adds, “That way stress becomes a cue for mindful, courageous action rather than avoidance or other unhelpful reactions.” Just as most of us would never turn in the first draft of an important document, every time we practice a courageous conversation, we evolve our thinking and strategy, while simultaneously increasing our behavioral flexibility for the real conversation. Second, many people still think of courage as a lone act. But both articles emphasize and myriad research supports that you need to build allies to make a long-term positive difference. If one person speaks up, it’s easy to discount it as one person’s opinion (and if you work in a toxic environment, it’s easy to become a target for retaliation). Two people speaking up is better. But three people speaking up starts to represent a “point of view,” which creates the leverage to change a system. And women have an advantage in this area. Although the “fight-or-flight” stress response still gets most of the attention, in 2000, Shelley Taylor, PhD, and her colleagues, discovered a more common stress response for women: to “tend-and-befriend.” This response makes sense evolutionarily, when tending to the young or more vulnerable, and befriending: building alliances and social support, was the best way for women to protect their offspring and propagate the human species. Last, both the individual and the organization need to take responsibility and make the changes necessary to ensure that everyone can contribute. 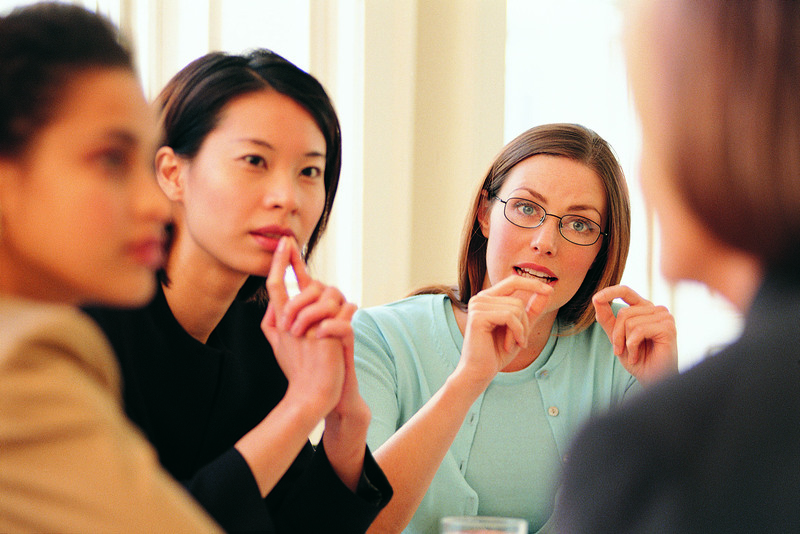 Too often, women are given individual coaching without accompanying efforts that encourage input from all team-members – particularly those who normally aren’t heard, and that raise the awareness of the rest of the team on the how and why of giving and receiving feedback. Sometimes the most courageous act for those with dominant voices is to be quiet and invite others to participate. Effective leaders create shared leadership with shared power and responsibility to initiate and experiment with changes that improve collaboration and achieve both individual and shared goals. They develop processes that are designed to ensure ongoing exchanges of important ideas, information and data that enable individual, team and organizational success. The upcoming blogs will focus on specific examples of courageous women leaders and actions in the workplace. If you would like to join in this important conversation, please share any of your own examples or stories of others’ courageous actions using the hashtag: #thecourage2lead. We look forward to hearing about your sources of inspiration. Remember, courage is contagious. Your actions can inspire others and help to create cultures of courage. Volvo North America chief says pushing for rapid growth in U.S. It should be noted that this isn’t Google’s first stab at a more comprehensive backup solution for Android, however. Android has had a backup API for years, but it required more effort on the part of developers. Lollipop was another step forward, though in practice it only really restores a limited number of things—Wi-Fi settings, wallpapers, language and input settings, and a few others are restored reliably, and Android is good about restoring the specific apps you had installed from Google Play. Backup of app data and settings usually doesn’t work, though, since developers need to expend more effort to make it work. The Android M backup system is opt-out rather than opt-in, which should help with adoption. All data is backed up to a private folder in Google Drive, and data kept in that folder does not count against your regular Drive storage quota. Developers can use an XML configuration file to explicitly exclude or include certain data, and users can opt out of the backup service altogether. Google also says that “large files” and temporary files generated by your apps won’t be backed up by default. Canada’s reliance on natural resources – particularly oil and gas production – is constantly held up as an economic and environmental weakness that needs to be fixed. But a new study from the Ottawa-based Macdonald-Laurier Institute provides a much-needed reality check: resources are more important to Canada than many realize – or want to admit. Philip Cross, a senior fellow at the think tank and the former chief economic analyst at Statistics Canada, said natural-resource industries directly contributed $260 billion or 16.6 per cent of GDP in 2010 alone (the most recent year for which figures are available), with mining and oil and gas leading the way. Among the surprising conclusions is that resources also account for a big part of Canadian manufacturing – 46.2 per cent of all manufacturing output in 2010 – and affect all industries in Canada, such as business and financial services that keep large urban areas productive. When it comes to business investment, natural resources punch way above their weight. They are now Canada’s dominant source of business investment, with the energy sector far outpacing the rest. In 2013, resources accounted for $144.5 billion or 61 per cent of all business investment in plant and equipment in the country, up from 38.2 per cent in 1999. They also account for the majority of Canadian exports, or 58.3 per cent of all merchandise exports in 2014 – or $308.4 billion – up from a low of 39 per cent in 2000. Resource industries employ about 14 per cent of Canada’s workforce, which is a smaller proportion than their contribution to GDP and a reflection of their capital-intensive nature. In 2013, 304,200 people worked in natural resources – nearly a third more than in 1987. The study offers some reason for optimism for resource industries, despite the pullback in commodity prices that is causing many companies to shelve plans. Recessions in resource industries are different from those in other sectors, like manufacturing or housing, Cross writes. In other sectors, downturns tend to lead to lower output. But resource industries adjust to lower demand through lower prices and profits, not production cuts. In his study, Cross takes a broader view of resources than other researchers. He includes primary extractive and agricultural industries (agriculture, forestry, fishing and mining), as well as utilities and industries that rely on resources for greater than 17 per cent of their inputs, such as primary metal manufacturing, pulp and paper manufacturing, and pipeline transport. His conclusions are not news for resource sectors like oil and gas, which has often highlighted its super-sized economic contribution as a way to gain acceptance for infrastructure growth plans. Will Putting Silk Road Founder Ross Ulbricht Behind Bars Accomplish Anything? Friday Silk Road founder Ross Ulbricht will be sentenced. He faces the possibility of between 30 years to life behind bars because drugs were bought and sold on his website. The prosecution is painting him as a major drug dealer and blaming him for the deaths of six people who overdosed (without acknowledging that our current drug policies lead to 35,000 accidental overdose deaths per year). On the eve of his sentencing, it’s worth considering: what will we actually accomplish by putting this man away? The fact is, the existence of Silk Road proved something we all know to be true: millions of people around the world want to use and buy drugs. As many have argued, including my former colleague Meghan Ralston and Phil Smith on Alternet, Silk Road’s online marketplace actually reduced the harms of drugs in several key ways. Silk Road reduced the potential violence associated with buying drugs. By taking away the need for face-to-face interaction, Silk Road reduced the violence commonly associated with drug purchases. It also took power away from cartels. It allowed for better knowledge about content and purity. One of the greatest dangers of drug use is that it’s very difficult to know if you’re getting what you intend to get, especially with today’s rapidly diversifying synthetic market. Using a review system similar to what you’d see on Yelp or other sites, a seller who was not representing his or her product accurately would not have customers long, and a user could be sure about his or her purchase. It encouraged harm reduction among users. Silk Road had a whole section of its site devoted to safer drug use practices. It’s relevant and important that this kind of content reach people at the very place where they are making purchases. Ulbricht’s defense recognized this and included these arguments in their memo to Katherine Forrest, the judge handing down the sentencing. If nothing else, a shorter sentence might help acknowledge the reality that no matter what your opinion about drug sales, Silk Road served as harm reduction for these marketplaces. Friday, the path of Ulbricht’s life will be determined. But his sentencing will have little to no impact on those millions of people who will still buy and use drugs. Other online drug marketplaces will arise and the violent, wasteful drug war will carry on unchecked. Unless we end 40 years of failure, and consider the lessons from Silk Road, and think about a new approach to drug use and sales. Stefanie Jones is the nightlife community engagement manager for the Drug Policy Alliance. Last month, some editorial members of Gawker Media, owner of various web properties including Deadspin, Jezebel, Gizmodo, and of course, Gawker.com, announced they planned to form a union. Now, with an election scheduled for next week that will decide whether the company will unionize, Gawker writers have made their votes and opinions on the plan public in a post published Thursday. The discussion offers a rare look at how wrenching labor organization can be. Some pro-union writers have been so turned off by the process that they’ve decided to cast their ballot against unionization efforts. Draper goes on to list a set of grievances that turned him against unionization, including a perceived lack of communication and transparency from union supporters and an election the writer feels was scheduled too soon. Those issues are echoed by a number of other staffers, including Deadspin columnist Drew Magary, who added that the push toward organization had turned many staffers against one another (“This has created a GALACTIC amount of acrimony within Gawker”). Magary also voiced concerns about the everyday implications of unionization (“I f***ing hate meetings.”). Stef Schrader, an editor for Jalopnik, questioned whether a raise that would include union dues could force the company to cut into other benefits. “I don’t agree that we need to pay an outside entity to negotiate these things for us,” posted Schrader. Most staff commenters appear to support unionization. If the pushback against organization by some writers comes as a surprise, it shouldn’t. Online media companies, despite being populated by many young city-dwellers who, as a demographic, tend to skew towards the left, have generally been reluctant to unionize. If Gawker does become a union shop, it would be the first major new media company to do so. Why is the digital press so reluctant to band together? As the Washington Post explained in January, a combination of generational and economic forces tend to make unionization less palatable to online scribes. Younger workers are typically less familiar with unions and more apt to see themselves as personal brands instead of as part of a collective. A Hyundai representative also did not answer the question directly, saying through a statement, “as a company that place the highest priority on ethical standards and transparency, Hyundai Motor is extremely concerned about the legal proceedings being taken against certain FIFA executives and will continue to monitor the situation closely.” A Kia official in the U.S. directed the Qatar question to the company’s headquarters in Korea, where the FIFA sponsorship is managed. We will update the post if we hear back. Hyundai is the parent company of Kia.